The FT2000 is my primary transceiver, it does everything in the world, but there are very many configuration options. I'll make some suggestions here. - There are dual receivers, and I link them using parameter 034 GEnE TRACK = FREQ. I then can select the optimal receiver that I want to hear by turning up the AF GAIN for the more desirable receiver, and turning down the AF GAIN for the other receiver. More often than not, the subreceiver hears noticably better than the main receiver. In CW mode, using the COLLINS CW filter the subreceiver is vastly more quiet, and in SSB mode if there is any background noise or static at all, the subreceiver presents a clearer copy. For AM or FM, the primary receiver is much better, so I widen the R.FLT to 15KHZ, turn up the primary receiver AF gain and turn down the subreceiver AF GAIN for that. - Set the subreceiver RF GAIN at 3:00 position. This quiets the receiver I listen to most often, yet does not affect the resting value of the analog S-meter, which is an excellent indicator for the sub receiver since the two receivers are linked. - The FT2000 has two operating states, VFO or MEMORY. This is a key concept because it is possible to tune a memory and it will seem like the VFO is being tuned. If the MR or MS is lit, the FT2000 is in memory mode. - In the VFO configuration, the MR and MS indicator should always be unlit - press V/M repeatedly until that happens. Also the frequencies should match - press A>B for that. The only indicator around the subreceiver knob that should be lit should be M.CH. - Using this method, all frequency tuning will happen using the main VFO knob and this will affect both receivers. The subreceiver knob is only used from this point forward to set the main VFO to memories from the memory groups (more on that later) when the M.CH is lit. - If it becomes necessary to disconnect the receivers link to work SPLIT, press the A/B button to the right of the subreceiver tuning knob. Now the subreceiver knob is used to do all the frequency tuning, dont touch the main knob. Press A<>B swap as needed. Make sure the TX activator is pressed and lit over the VFO that you want to transmit on. After the DX is worked, press A/B to light M.CH, press A>B and you are once again linked up. Dont forget to reset the light over the transmitting VFO. In the VFO mode, the entire radio is available for dynamic change, the bandstack registers and the VFO's are always overwritten during normal operation. The purpose of the memory mode is to allow you to call up a memory, use it for a while, tune it up or down, and when you are finished the radio returns to the state it was in before you entered it. Note - dont press any of the band stack buttons in memory mode. Clear the MR and MT lights by pressing V/M repeatedly before pressing a band stack button if you want to keep your memories and band stack separate. Here is an example. If I press the 28/29 button 3 times (with MR and MT unlit) I see 28.010Cw, 28.200Usb, and 28.400Usb. I have a memory at 29.0Am. I press the V/M button and the MR indicator lights and VFO A is then receiving at 29.0Am. If I tune the main VFO knob, MR is replaced by MT and I can tune to example 29.050Am. None of this is recorded by the band stack registers or VFOs. After I am through on 29Am, I need press only the V/M button until the MS and MR lights go out, and the radio keeps no record of the fact that I was ever tuning the memory at 29.050, it only keeps the base memory. is at least acceptable even in harsh conditions (as in the example below) where the DSP is failing. IF DSP radios in those conditions. FT-2000 DSP side sounds 100% better than FT1000MP in many conditions, like low noise and wide filter width 4.0khz. would sound very restricted and unpleasant where the FT2000 would be like "in person". However in 80m/40m high noise conditions as in the above recording, and in narrow filter (CW), the operator must depend on the ANALOG side subreceiver. The DSP cannot keep up with too much noise coming in. If this FT2000 vs FT1000MP comparison was made with FT2000 subreceiver, then it is an "APPLES TO APPLES" true comparison and FT2000 will sound as good as MP. In my own comparison, the DSP side also sounds disappointing on FT2000 DSP CW (500hz) until the analog subreceiver is used, then the results are greatly improved. and I would not have a DSP only radio from any manufacturer until DSP is better than it is today. was as good as K3 DSP, the analog side might not be necessary, but it would still be "nice" to have. Going with K3 would be the best way to go if the human interface was not a concern. $2300 US, add $100 for Collins CW filter, and $300 for a roofing filter that works from AC0C. 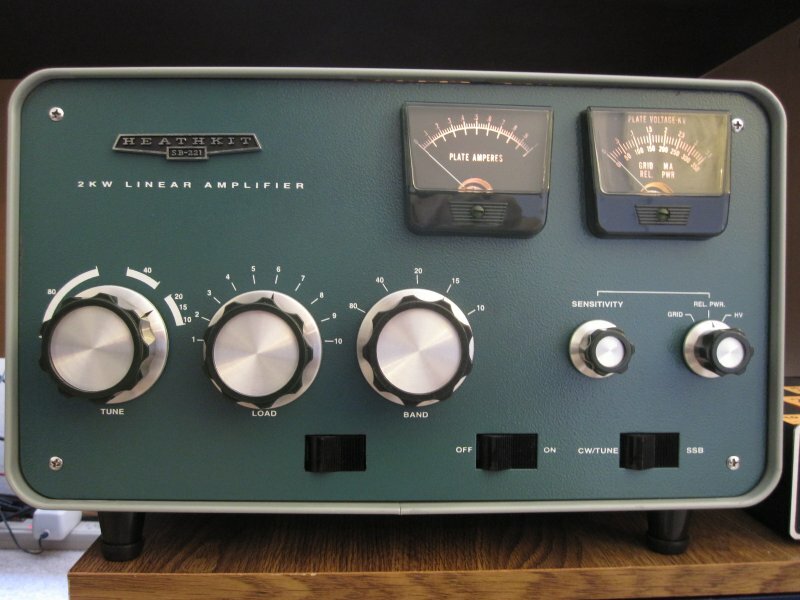 the premier HF transceiver in its price class. difference for one side or the other, depending on conditions. stored frequencies for that band. But, press V/M again to see "MR" and now you are flying in "MEMORY MODE". memory, and hear it while you turn the subreceiver knob. the memories within the selected group. happy tuning the one memory you have selected from scrolling. on your original fixed memories, and will "disappear" after you are done with them. To save one of these tuned memories (MT on display), press M->A and hold it down. You are now in "VFO MODE" again with the tuned frequency on the main display. Store the frequency to a memory or tune away. large sweeping LED glows to indicate subreceiver control from that knob. the MAIN or SUBRX knob determines where the transmit happens. unless the AC0C mod is performed, this is strictly hardware. There is this also free program from IW1AWH that is simply astounding. values of the FT2000 menu to the computer screen. only transceivers at several times the cost. best it can be right now. and I understand they will never "forgive" the great injustice. The "zero"
simply because of roofing filter or speech processor complaints. big money in the process. The free "PEP" update from Yaesu is the key. All right, I found the Sherwood BDR numbers a bit disconcerting for FT2000. Close in Dynamic range at 63db. That number in itself is not good. Being so impressed with the rest of the transceiver, I decided to do a test, call it the poor mans Sherwood test. ;-) I connected the FT2000 to a 20 meter antenna, receiving at 14.047.5, CW mode, and 500hz. I setup a K3 transmitter into a dummy load located in close proximity, so that then transmitting on 14.047.5, the FT2000 showed 50db over S9. However imprecise, that is a BIG signal. Then I tuned the K3 transmitter for 14.056. That is just outside of the 6khz roofing filter. W1AW CW bulletin was an S5 copy in the clear on the FT2000. When the K3 was transmitting, the W1AW signal was clearly masked by desense, almost uncopyable by the strong nearby signal, however that only happened when the 3 or 6 khz roofing filters were used! Talk about counter intuitive. Switch to the 15khz Roof and the signal was again a clear copy, even though I detected a very small amount of desense. First lesson: My FT2000 (YMMV) roofing filters are 100% gimmick, not to be used nor trusted. The other lesson - even without the "Roofing filters" at 3 and 6 khz, this is a -very- fine receiver in the face of the poor BDR numbers. My feeling is that FT2000 does not have the upper 10% of performance required to operate a full contest, reported scores, etc. without some missed QSO's in the process. However, for the vast majority of casual operation with some contesting this radio is really very good. Now the roofing filters are a non functioning feature on FT2000 and I have suggested they are not necessary. This doesn't mean that Yaesu didn't -try- to make them work. Word is that at one time they both functioned (the 3 and 6 khz filters) at the 7 khz value, and I don't know, maybe someone else's firmware version w/FT2000 may still do that. What mine does is attenuate the IF gain by about 12db in either the 3 or 6 positions. So, that's what I use those roofing positions for, some attenuation when I need it. It seems to work best on 40 meters and at night or in any tough conditions using the 15khz roofing filter. It is said that the attenuation was added to the 3 and 6 roofing filters as a result of some failed attempt to narrow down the 3 khz roof and in the process impedance was compromised - thus the attenuation. It is also suggested that circuitry into the FT950 has been added, since it was a later design, to properly balance the circuit. The FT950 does not have the 3khz roofing filter wart of the stock FT2000, but the FT2000 fitted with the new aftermarket NS filter exceeds both of these configurations by an order of magnitude. 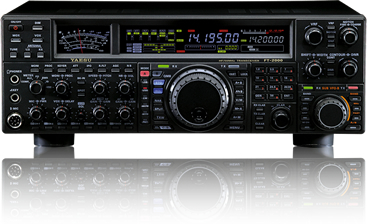 When the FT2000 was rolled out by Yaesu in early 2007 it had two major shortcomings. The firmware was not ready and neither was the narrow 3khz roofing filter. Following manufacture the firmware was eventually corrected, until the "PEP" update resolved the vast majority of the DSP problems. However the 3khz filter could only be made to function by Yaesu's cobbling the filter circuit enough to show the 3khz spec under lab conditions. In practice, the 15khz, 6khz, and 3khz roofing filters are actually 15khz, 7khz, and 7khz wide. These stock filters are 69mhz filters and the reason Yaesu could not get the 3khz filter to work was because they hoped a cost effective 3khz at 69mhz filter would be available at production and it just did not happen. Jeff Blaine later found the filter they were unable to locate using his commercial connections in the RF industry. The cost of the NS filter was $300 when I purchased mine, for me it was the best $300 I ever spent on a transceiver accessory. I don't care about specs, the FT2000 has big signal handling that is sufficient for my antennas and bands in stock configuration. 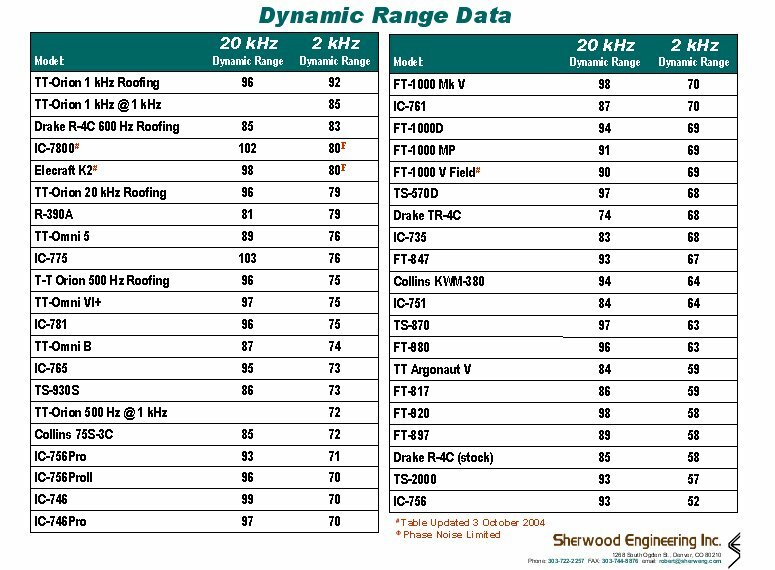 However, Rob Sherwood arranges his list of receivers in "Dynamic Range Narrow Spaced" order and FT2000 had a weak preliminary test due to the firmware revision and some other factors. So the FT2000 results are pages down the list from the top performers which show better than 90db. The FT2000 is listed among the weaker receivers at 63db. I have used some of the radios in that group and can say my (PEP firmware upgraded) FT2000 by no means had the AGC pumping problem, desense, or some of the other problems I have experienced that is common to the group of transceivers listed around it at 60db. That having been said, the NS filter upgrade would move FT2000 well up Sherwood's list if he were to retest it, I am told approaching 90db. Even the popular contest rigs FT1000MP and FT1000D were only upper 60's performers. Nothing special, there are many other factors that matter more with receiver design but if you have the NS filter - your FT2000 spec is Orion class. I made some observations in the day to day operation of FT2000 with the NS filter, these were posted to the Yahoo reflector and are detailed in the text below. The executive summary is that receiver performance is greatly improved for phone modes using the NS filter, even when there are no BIG signals on the band. There is a recording, listen yourself. The quiet spots are the NS filter. It took no special conditions to setup the test, and it can be reproduced easily. The NS filter itself is beyond large in comparison to all the circuitry around it, yet there is an area for it to fit which is close to the connection points and where the filter case does not stress any of the internal components. I am at a disagreement with some others about the relative ease of installation, it was one of the more difficult things I have ever done, due to the SMT sized solder pads that the filter coax is connected to. There are only 4 connections to FT2000 but they are smaller than a SMT resistor and you are trying to get coax braid attached there. Strain relief is a major factor, the wire I used is thin enough to break when it is pulled on rather than lifting the FT2000 PCB trace. The modification is reversable in practical terms, restoring the trace that must be cut with a hobby knife would actually be much easier than making the original cut. It is hard to see if the channel is clear of debris after the cut because of the trace and the clearcoat debris after scraping a path. There is also a SMT resistor that must be removed. The most challenging part of the job is connecting one wire at the PCB which is overhung by a transformer can. It is a very small margin, magnification and bright light is a must. See the photos on the Yahoo FT2000 group to get some idea of this. I have built SoftRock and other SMT, which in comparison was a breeze, I ended up using smaller wire for the job than you will see in the Yahoo FT2000 group photos. - Listening on USB, 14 mhz, no signal, antenna connected, IPO activated. DSP bandwidth set at 2400 hz. Theoretically there should be no difference when toggling through the ROOF positions, yet, I can detect the 3 khz position in a blind test toggle through all positions, NS is more quiet. Remove the antenna, and the difference is no longer detectable. - In my tests under many conditions, the FT2000 DSP (WIDTH control) will faithfully restrict bandwidth to (the same) 2500hz just as the NS filter does, but the detected audio from the NS filter is greatly desirable to the output of the DSP algorithm fed by the stock roofing filter. Listening fatigue is reduced. I've tried all the bandwidth options from SCAF filters to DSP to narrow dedicated SSB filters - the combination of this NS roofing filter and the YAESU DSP to provide NOTCH, NR, etc. is something special. It really makes me wonder if the stock FT5000 DSP, having the better ultimate selectivity that you would install a NS filter in FT2000 to approximate - sounds as good in the end. This recording was made using FT2000 with NS Filter under optimal conditions on 10 meters 28.400 to display the improvement of the NS filter in the FT2000 audio. The improvement is more difficult to demonstrate for detection of weak signals in contest conditions, but it is obvious as well. The original test (not in this recording) was using the FT2000 IF DSP dialed to 4000hz and yes when the 2.4khz NS filter is selected, a great deal of unnecessary noise is removed and yes this is very obvious. However in this recording the DSP bandwidth is selected at 2400hz and this is of course -inside- the NS filter bandwidth. Assuming no large signals on the band, there should be no difference in the detected audio because the roofing filter is only supposed to eliminate signal overload. However it is obvious in this recording that the FT2000 DSP benefits greatly from the NS filter (stock filter garbage in = garbage out). The difference you hear is not due to attenuation, in my installation there was no loss from the NS filter compared to the stock filter. The NS filter is also greatly more effective than the stock roofing filter in noisy band conditions, however this recording was made on a quiet morning 9am in Southern California. The beep that is heard is the R.FLT selections, counting the fourth beep and you hear the NS Filter. First is with no SSB audio, then the next cycle is with some USB audio. What you cannot hear in the recording is that the fidelity of the NS filter is quite good (pleasing) even when compared to wider DSP settings using the stock roofing filter. I don't know what the rate of distribution of this filter is, but I do know that it took almost a year for all the hard work to be done by an all star technical team for this window to be open now for however long it stays. If anyone is sitting on the fence for any reason other than availability of $300 bucks - I would suggest in the strongest terms that they get off the fence and take advantage of it. All of the HF fun, and none of the hassle. It has been a long time since the OMNI VI+ was reviewed on eHam. It seems the DSP rigs have stolen all the thunder these days. 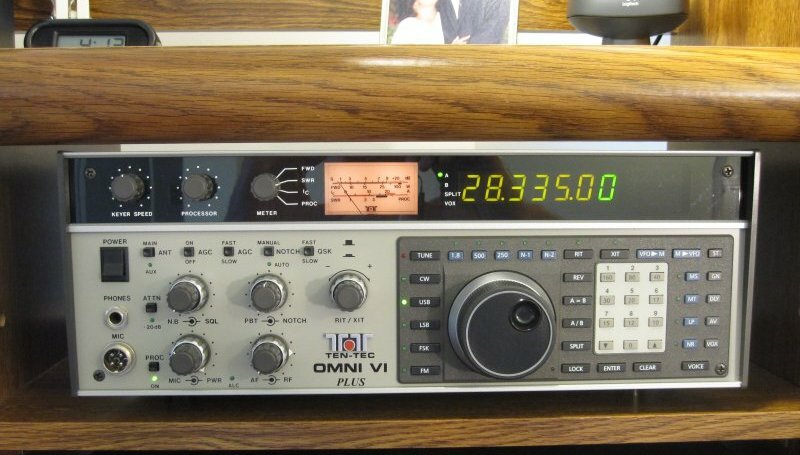 I had one and sold it for an IC756Pro and after using it for two years went directly back to OMNI VI+. I am a 95% CW operator. When I bought another OMNI VI+. I added the two most important upgrades, the TCXO was added at the factory, and I added dual Inrad 2.8khz SSB filters along with a single 400hz Inrad Cw filter. 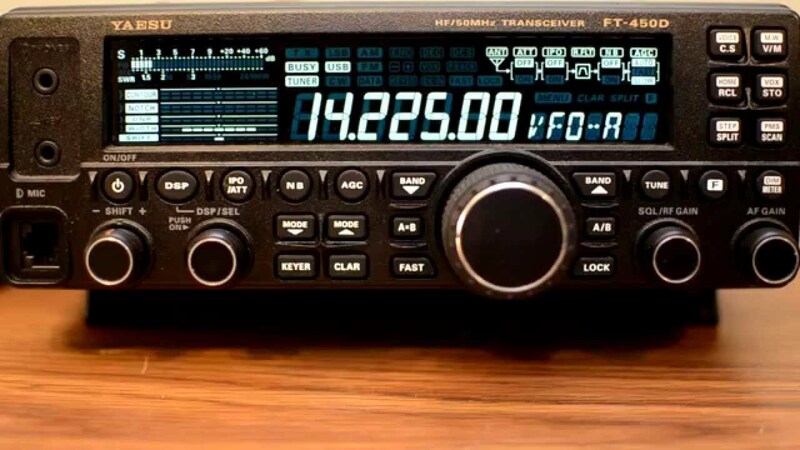 I will say that the OMNI VI+ is the most capable and user friendly transceiver that I have ever used, with the Icom IC751a (also the IC761/765) running neck and neck with it until you consider the incredible Ten Tec QSK and the fact that the Icoms have a fan. going into the antenna. Even the K2 does not QSK as well as the OMNI and the receive audio is not nearly as pleasant. With the wider Inrad filters, it has all the fidelity one could want on SSB but without them it sounds like 1980's SSB - very restricted. with TCXO is very stable - essentially it is as stable as the BFO crystal that's in use. Lots of guys have moved on to Orions, Jupiters, MP, and TS2000. But this radio stands in during contests better, and is more comfortable during a CW ragchew than the others. No boot nor reboot needed. The display, meter, and knobs are all man sized. This radio has been revised, updated, and improved over so many years and none of that time was spent on computer bugs, it all went into actual improvements of the radio. With the mods suggested, in my mind it will be a long long time before anything else comes close to it - if ever. The SB221 is the later model SB220 offered only without 10 meters due to FCC restrictions. However there was a conversion kit for 10m available from HEATH. If you dont have an SB221, here are the bullet points. The filter capacitors and meter board have been replaced with Harbach's offering. On a weak 110V AC line (like mine) voltage drops can limit your output to 500 watts even with good tubes. The stock amp keying circuit can ruin your modern solid state radio, get the Harbach "soft key". The amp itself is a gem, but is built very very lightly. This makes it easy to service on a tabletop, it's compact, etc. but it is mostly a thin aluminum cabinet and chassis bolted to a big honking heavy transformer in the middle. Even if the transformer is removed (as mine was) to UPS ship, the main unit can be damaged - the bandswitch is ceramic and that will crack in a heartbeat if the (band select) knob is not removed before packing. New front panels and knobs are available for SB221, the panels are black or original. I never considered for an instant buying a new "mighty fine" amp even though their service would seem beneficial and the price is in the ballpark of what you would pay for a 30 year old SB221. Having this classic amp inspires confidence, it's fun to use, and with all the third party products available for it, I've never looked back. I bought the FT450D in May 2016 as the 100watt transmitter side for my SDRPlay receiver and as a backup for my fixed station HF. I was hooked by the Hamvention price of $599 online. There was a short wait from GGParts. The original SDRPlay had been marked down to $125 at HRO when the RSP2 was announced. The radio has proven to be a very desirable addition to the hamshack along side of my FT2000 flagship HF. After some time using it, I find the FT450D to be greatly better than most entry level standalone HF rigs and comparable or better than many mid priced transceivers when used with an external SDR such as SDRPlay or Afedri. Although the footprint is small, the receive current draw should be lower for mobile operation and a little high for portable. There is ample AF Gain and I don't hear the fan running at all on receive. The fan increases speed on transmit and I do hear the air moving but no fan buzz. This is a super CW radio and a good phone radio. The receiver AGC is excellent. In fact, it is a great compliment to this rig that it sounds so much like analog, digital artifacts are surprisingly absent. The crystal filter is 2.7Khz on tx/rx. Using a computer soundcard and equalization you can find some great fidelity on receive that you would never guess was present when using the internal speaker or a small portable speaker. The trick is to set the Contour control to PEAK, rotate fully CCW for BASS and to set the EQ at the PC for BASS boost. The EQ at the PC is less important than setting the Contour control. I use a preamplified D104 on phone transmit to maximize the 2.7 khz transmit bandwidth available. The modular microphone jack is not the easiest to wire but the included hand microphone really needs to be better for fixed station use. There is no Automatic DSP Notch, but the manually adjusted dsp notch is outside of the AGC loop, so you don't have the S Meter showing 20db over S9 with an associated reduction of the RF Gain as you would see on the typical auto notch after nulling a big carrier. You can also turn off the AGC and rotate the RF Gain at the front panel for just the right receiver sensitivity. The unit is of very nice construction and in fact, even though I originally bought this unit to be the "hidden transmitter" side of a Windows SDR receiver. With an MFJ automatic antenna switch you can use any of the wonderful computer SDR programs on receive and fully control the FT450D as transmitter from that program. SDR Console V3 is may favorite, HDSDR also integrates seamlessly. I found myself wanting to use the radio standalone as often as not on CW. You get 100 watts, Auto Tuner, All Modes, 160m through 6m and that is a lot! I ran a TS480Sat for over a year and that one is a great design, it has Auto-Notch, but all and all I do prefer the FT450, mainly because it has a better CW receiver to my ears. There is less noise and abetter AGC. This radio is an amazing value, for a backup or something fun to try with SDR, it's hard to lose with this one. I have the original MFJ-1708. It is a good little HF antenna switch but it does not share the receive antenna so if you want to use your SDR with an HF transceiver for transmit, you have to be listening on the SDR only. The transceiver does not have the antenna until transmit is happening. I like it because I listen to the SDR and transmit on a smaller less expensive FT450D. One downside is the MFJ-1708 AUX relay output used to switch linear amps or mute external receivers has normally closed contacts. I am in the process of installing an additional relay to correct for that. This means there will be two relays clamped while operating the original model, but the MFJ-1708 "B" actually uses four. I just bought the newer model, MFJ-1708B-SDR. This was designed for use at even greater than 30Mhz - claimed to be good up to 70cm. It does share the receive antenna so I can listen on SDR and FT450D at the same moment... but... there is a small insertion loss, about 3 db that the original model does not have. A new circuit was added to allow proper sharing of the receive antenna, there is a small transformer for that. The original MFJ-1708 can be modified (add a wire) for shared receive antenna but unhappy things (attenuation and crosstalk) can happen depending on the physical devices being shared. For those with open framerelay amps, Winkeyer USB has a parameter used to key the amp a specified amount of time before sending the first CW element. Connect the PTT output of the keyer to the control input of the MFJ-1708. On SSB timing on transmit is less of a problem for the transmitter and the amp. I highly suggest never depending on RF sense, always use the control line. MFJ new units sometimes have problems with the receive splitter transformer so place the SDR on the transceiver position and note the backround noise using the SDR Program, then short the control line. This will compare the shared receive circuit to a direct connection. 3db is typical, any more than that and examine the magnet wires to be sure the insulation was removed properly before soldering. My FT2000 does a better job switching antennas internally for the SDR, but if a rig does not have this, the MFJ-1708 is a cost effective solution.